This past season we were all supposed to be frugal. The economy was not, ahem, in the best of states. It was all about consumer consciousness, about not going over the top. Interesting then, to note the frou frou that found itself on many a runway. 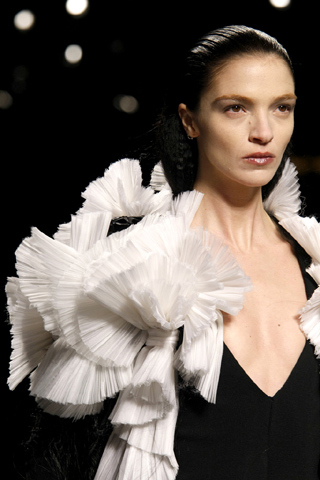 There were the intricate ruffles and pleats at Givenchy. Of course, it was present in couture at Chanel. 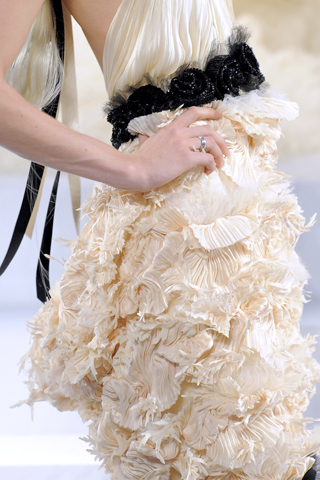 Hip to be rich at Chanel HC FW09. 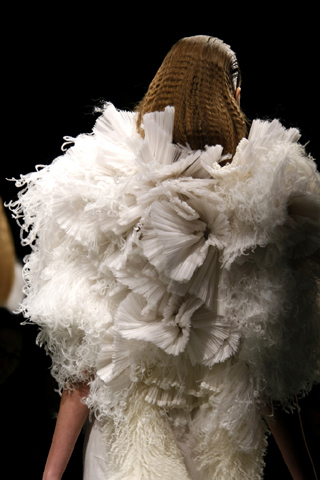 The collective pouf reminded me of McQueen from a few years back. 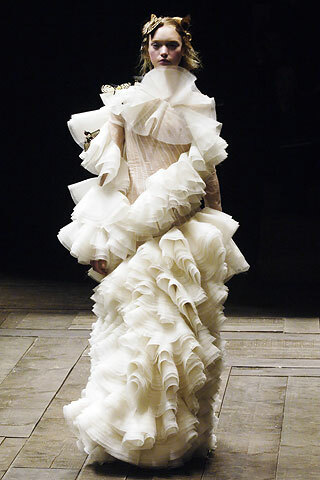 McQueen's fairytale dress from FW06. 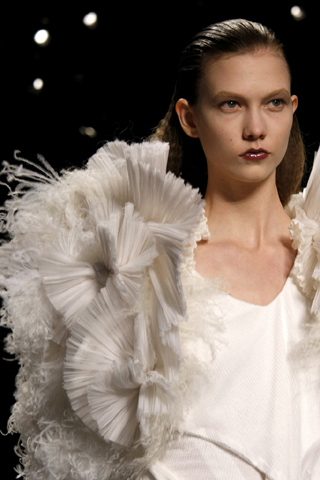 Designers in the Motherland – a country known for embellishment – went full on with their frill as well. 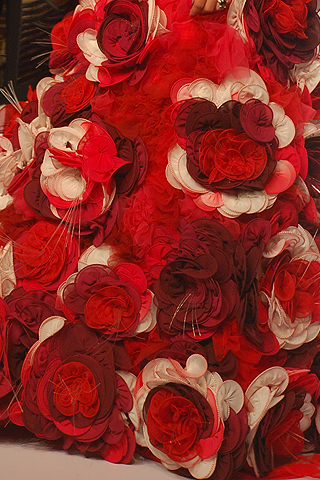 Archana Kochar showed this gown made of stunning organza flowers. 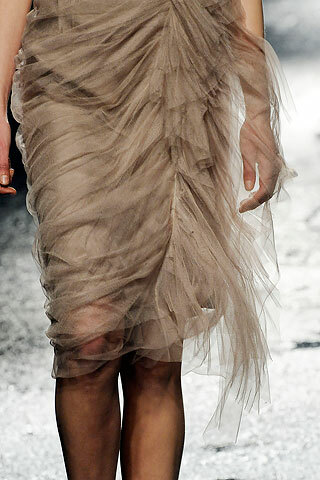 The big skirt was also present at Valentino couture. Liya Kebede looked glorious in Elle Italia. Liya in Elle Italia. Go big or go home. The lainga – the original desi ballgown, complete with gilded tassles – was not about red ink at all. Nikasha Tawadey FW09 lainga. Photo by Manav Manglani. Loved the simple suit and ruffled coat at Nikasha Tawadey, too. Nikasha Tawadey ruffles some feathers. Photo by Manav Manglani. My favourite frou was at Lanvin – feminine and delicate – and perfect on Rosamund Pike at the BFAs. So, were designers off their custom made rockers? Or were they just trying to give us an escape? Western collection shots courtesy of Style.com. BFA shot courtesy of Glamour magazine. All others, courtesy of Vogue India.